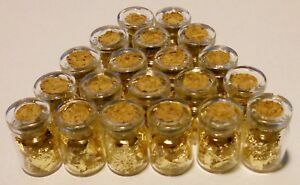 Lot Gold leaf flakes in 10 glass vials,best quality excellent price!!! #14. 3 Glass jars with 24kt gold leaf.PACKED full of just gold no oil! As a souvenir store owner, I wanted to add to the small items assortment and this was perfect. Now when a customer asks if we have gold, I point these out, they chuckle, comment on how cute they are, and they buy one. Happy customer, happy seller, mission accomplished! Looks alot bigger in the pictures. Really miniscule bottles. Would've been better off buying some sheets of gold leaf. Bottles so small is almost impossible to get the cork off to access the gold inside. Gold in dem dar hills !